A rare documentary including interviews and live performances by Radiohead. When indie-rock saints Radiohead released their latest album,The King of Limbs, on the internet two weeks ago, the internet had the usual response: foaming-at-the-mouth ecstasy. The band has been pushing genre boundaries in its music for nearly two decades, so what better opportunity for a look back on how far they’ve come? Thanks to Jamie Gurnell’s infographic A Genre, Radiohead fans can do just that. Gurnell wanted to classify the activities of a band he deems “the very definition of ‘unclassifiable’.” The product of “several hours of quite enjoyable listening and debate”, his infographic is, of course, just one man’s opinion of Radiohead’s musical zigs and zags over its 18-year existence (technically the band was formed in 1985, but its first real release, Pablo Honey, came out in 1993). Besides the fact that the band is in essence more alt-rock than electronic, they’re literally all over the map. 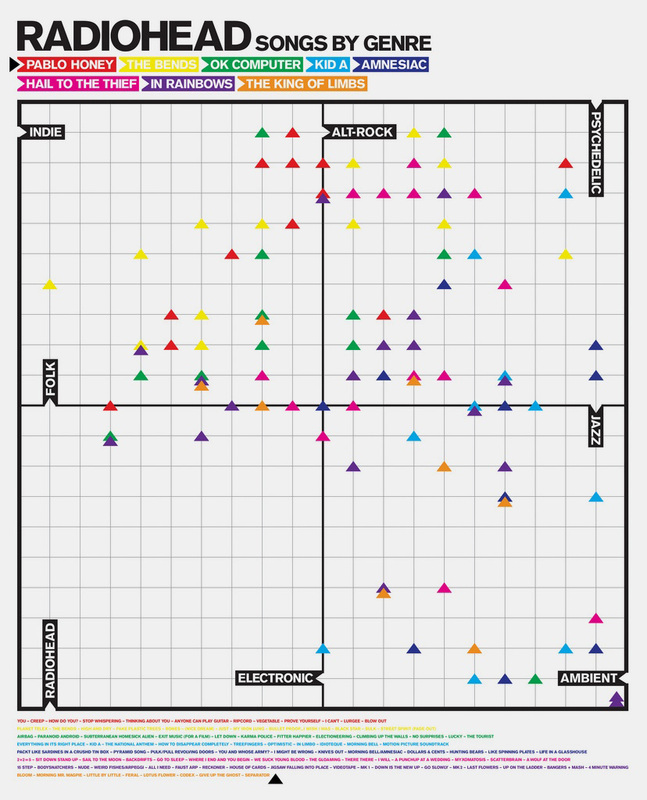 If you like their wonky electronic work as much as I do, simply follow the vertical line down the center of the graph (Kid A andAmnesiac are obviously represented, but so is Pablo Honey). It’s about time we heard some new music from goth-pop queen Bat for Lashes. AsTwentyFourBit points out, the woman otherwise known as Natasha Khan has covered“Strangelove”, the great 1987 single from fellow synthed-up sensualists Depeche Mode. Bat for Lashes’ silky cover is being released as a promotion for a new Gucci fragrance, and you can head over here to stream and download it. And below, check out a video of Bat for Lashes covering Radiohead’s “All I Need” live last year. Camera work is a bit shaky at times, and the bonuses aren’t quite as high quality as the songs from the 5th. The ends of the songs are quiet abrupt at times too.